À partir de 2007, la crise financière et économique mondiale a provoqué dans les pays industrialisés une brusque montée du chômage, une baisse du pouvoir d’achat des ménages ainsi qu’une déstabilisation du système bancaire mondial. Les effets de la crise ont agi comme un catalyseur de tendances de fond observées depuis quelques décennies (mouvements altermondialistes, critiques du système agro-industriel intensif, etc.) et ont intensifié un questionnement citoyen sur les modes de production, de financement et de consommation actuels. Cette remise en question a notamment été illustrée en 2011 par des mouvements comme celui des Indignés en Espagne ou Occupy Wall Street aux États-Unis, promouvant un modèle de société plus responsable. Les pratiques visant à échanger et à partager des biens entre particuliers ainsi qu’à limiter les intermédiaires entre producteur et consommateur ont connu un engouement progressif; donnant naissance à un ensemble d’initiatives rassemblées sous l’appellation de consommation collaborative. Ce mouvement récent et grandissant s’appuie sur des pratiques prénumériques telles que les Systèmes d’Échanges Locaux (SEL), qui ont vu le jour en France au début des années 90. Il s’agit de systèmes d’échanges de produits ou de services entre les adhérents d’un même groupement associatif, selon une unité propre à chaque groupe. On peut également mentionner les Associations pour le Maintien d’une Agriculture Paysanne (Amap), qui permettent aux consommateurs de s’approvisionner directement auprès du producteur, ou encore les recycleries qui collectent, réemploient et valorisent des objets de seconde vie depuis 1984. La popularisation de ce phénomène et son essor à grande échelle ont notamment été permis par la forte démocratisation des nouvelles technologies de l’information et de la communication (NTIC), se traduisant par des taux d’équipement en informatique particulièrement élevés. Les NTIC ont contribué au développement de plateformes internet accessibles au plus grand nombre, permettant de mettre en relation des particuliers ne se connaissant pas au préalable pour réaliser des transactions. Les NTIC et le e-commerce ont également contribué à faire évoluer la relation unissant consommateurs et entreprises en modifiant les manières de s’informer et en démultipliant les possibilités d’interaction et de coopération. Les années 2010 ont vu l’émergence d’un mouvement d’empowerment du consommateur, qui s’implique de plus en plus dans les transactions et se positionne comme un "consommacteur" exerçant une influence sur la marque, les prix et les produits/services (forum deconsommateurs, appels à idées, customisation de produits, comparateurs de prix, etc.). Le rapport de force se modifie notamment dans les pratiques de consommation collaborative, pour lesquelles le consommateur passe du statut unique de "demandeur" à un double statut d’"offreur-demandeur". Horizon 2020 has a single overarching objective: the achievement of scientific, technological and societal impact based on excellent research and innovation projects. It aims to achieve economic impact by supporting industrial competitiveness, economic growth and job creation. It aims to achieve societal impact by developing the means to respond effectively, quickly and efficiently to the urgent societal challenges (climate change, loss of biodiversity, ageing, etc.) Europe is faced with. This brochure, which presents examples of research and innovation projects funded through past EU programmes and constitutes a record of impact, shows that the ambitious goals set for Horizon 2020 are fully justified. How should Europe respond to the increased demands on our food and agriculture systems arising from global population growth, changing diets, and competing demands on agricultural land? This report offers a view on how the EU could play a role in meeting these challenges in the coming decades and sets out some of the options which merit particular attention. It focuses on options for increasing agricultural productivity whilst adapting to the effects of climate change and reducing emissions from agriculture, the means of reversing continued declines in farmland biodiversity, the reduction of food wastage, ways to achieve a more resource-efficient food sector, and the options for using wastes and residues to meet biomaterial and bioenergy needs in a sustainable way. It brings together some of the analysis and results of five commissioned studies in a synthesis, considering the state of play today and some of the key developments on the horizon moving towards 2050. The European Union has strongly developed common environmental and agricultural policies, and a recently reformed Common Agricultural Policy with a greater emphasis on both the environment and innovation, providing Member States with an opportunity to initiate a change in direction. At the same time, there are major challenges to increasing productivity in an appropriate way whilst reducing damage to European agricultural and natural resources and biodiversity. It will be important to produce more with less in Europe and to cut wastage. Anticipating future developments in global agriculture is by no means a simple exercise. In the last few years, many of the acute phenomena observed have complicated further the formulation of long-term prospects. The turbulence of world agricultural markets, the price spikes of 2008 and 2011, the wide climate variability experienced in important production regions, and the enhanced linkage among agriculture and other markets such as the energy and the financial markets have propelled interest in revisiting the relations among agriculture, its natural resource basis, economic development, food security and population growth. Discussions of the relationships among these phenomena are lively, as are those on what can be done to prevent the onset of more frequent and more critical conditions in the coming decades. Given its various fields of expertise, FAO is at the centre of the technical debate on these themes. In 2009, FAO organized an expert meeting and forum around the question of “How to feed to the world in 2050”. This initiative was supported by papers authored by world-class experts. This work has been revisited, and is now presented in this volume. "This paper is a re-make of Chapters 1-3 of the Interim Report World Agriculture: towards 2030/2050 (FAO, 2006). 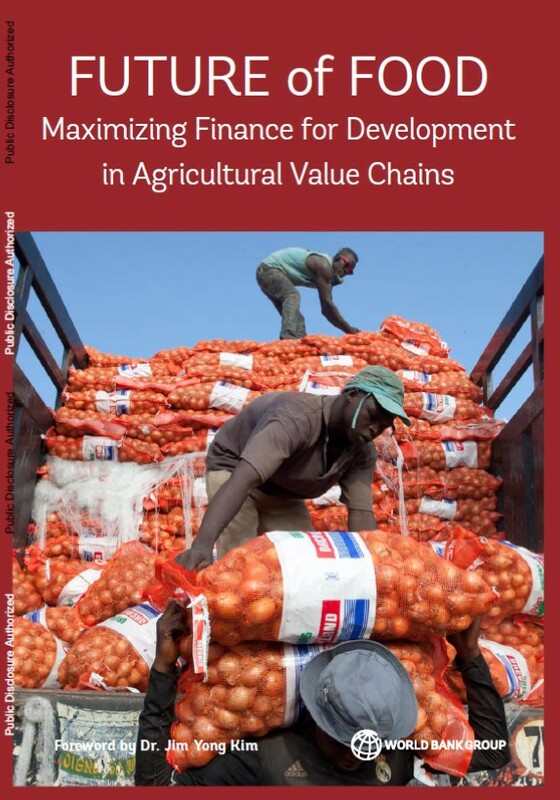 In addition, this new paper includes a Chapter 4 on production factors (land, water, yields, fertilizers). Revised and more recent data have been used as basis for the new projections, as follows: (a) updated historical data from the Food Balance Sheets 1961-2007 as of June 2010; (b) undernourishment estimates from The State of Food Insecurity in the World 2010 (SOFI) and related new parameters (CVs, minimum daily energy requirements) are used in the projections; (c) new population data and projections from the UN World Population Prospects - Revision of 2008; (d) new GDP data and projections from the World Bank; (e) a new base year of 2005/2007 (the previous edition used the base year 1999/2001); (f) updated estimates of land resources from the new evaluation of the Global Agro-ecological Zones (GAEZ) study of FAO and IIASA. Estimates of land under forest and in protected areas from the GAEZ are taken into account and excluded from the estimates of land areas suitable for crop production into which agriculture could expand in the future; (g) updated estimates of existing irrigation, renewable water resources and potentials for irrigation expansion; and (h) changes in the text as required by the new historical data and projections. Like the interim report, this re-make does not include projections for the Fisheries and Forestry sectors. Calories from fish are, however, included, in the food consumption projections, along with those from other commodities (e.g. spices) not analysed individually. The projections presented reflect the magnitudes and trajectories we estimate the major food and agriculture variables may assume in the future; they are not meant to reflect how these variables may be required to evolve in the future in order to achieve some normative objective, e.g. ensure food security for all, eliminate undernourishment or reduce it to any given desired level, or avoid food overconsumption leading to obesity and related Non-Communicable Diseases." 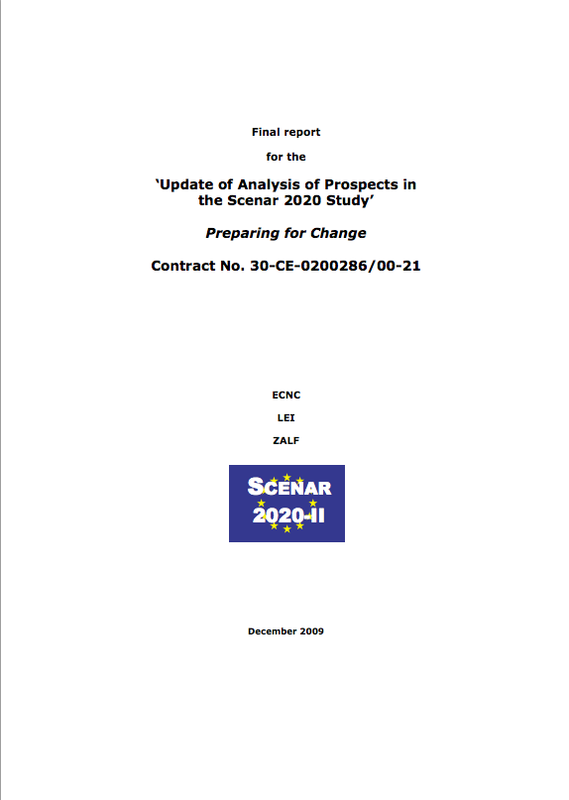 "The objective of the Scenar 2020-II study was to refine and improve the identification of major future trends and driving factors – and the perspectives and challenges resulting from them – provided by the initial Scenar 2020 study (December 2006) on the future of European agriculture and the rural world. In this respect the study does not aim at evaluating the impact of potential policy changes but to compare how the agricultural sector might evolve under different, and somewhat extreme, pathways which, to a large, although not full extent, follow the assumptions of the first study. To reflect elements of the public debate, without prejudging future policy proposals, three policy scenarios are proposed within Scenar 2020-II. The first is a 'Reference' scenario, in which reference policy decisions are carried forward in the time period of the study. For illustrative purposes it assumes a 20% reduction of CAP budget in real terms, the implementation of a Single Payment System (SPS) as of 2013, full decoupling, a 30% decrease in direct payments (DP) in nominal terms and a 105% increase of the European Agricultural Fund for Rural Development (EAFRD). Trade agreements are synthetically represented, e.g. the WTO Agreement is based on the December 2008 Falconer paper. To some extent this reflects similarities with the 'baseline' scenario of the first study. The second is called 'Conservative CAP' scenario, and keeps the overall level of the budget devoted to agriculture but changes the balance between pillars. It assumes a continuation of the results of the Health Check (HC) after 2013, a flat rate (regional model) implemented at national level, coupling as HC, and a 15% decrease of direct payments in nominal terms, a reduced (45%) increase of EAFRD. Trade policies are maintained as in the Reference scenario. The third is a 'Liberalisation' scenario, in which all agricultural trade-related measures are discontinued. The CAP budget is reduced by 75% in real terms, all direct payments and market instruments are removed, and there is a 100% increase of EAFRD. Like in the previous study extreme scenarios were chosen in order to test what would be the maximum range of impacts the agricultural sector would be faced with over the medium term.